Are you looking for a new recipe for sweet potatoes? I recently tried horseradish mashed sweet potatoes, and they were incredible. I wanted to recreate this dish for you. For the holidays we all think of sweet potatoes as being a sweet dish. I know my Boston Market Sweet Potatoes is a popular recipe. The Bostom Market Sweet Potatoes is almost a dessert recipe. While I like that sweet potatoes when they are a sweet dish, sometimes I want to serve something that is a bit more savory. Sweet potatoes do not need to be sweet, they can be savory, so often people just make sweet potato recipes that are sweet. Sweet potatoes are an excellent vegetable that can be made in other ways. This version of sweet potatoes has rapidly become one of my favorites. The flavor of the sweet potatoes is balanced nicely with a touch of horseradish. I like to serve this dish with beef or a heavier dish. I start the recipe by first baking the potatoes in the oven. I just wrap them in foil and bake them for about 1 hour, I peel the potatoes and then mash them in my mixer. I just add prepared a creamy horseradish sauce, melted butter, and a touch of salt. This is all that I do with the potatoes. For that is a recipe you want to use a horseradish sauce that is premade. I like the Heinz brand it is a very dependable sauce that has a known level of heat. I think you could use fresh horseradish, but I find sometimes it is hard to find, and it can vary in the degree of heat. I hope you give this recipe a try and that you enjoy these savory radish sweet mashed potatoes. These mashed sweet potatoes have just the right amount of heat. Preheat oven to 350 degrees. Place washed and scrubbed sweet potatoes on a baking sheet. Bake potatoes for approximately 1 hour. The potatoes are done when a fork pierces through the potatoes. When potatoes have cool enough to handle, peel potatoes and place in a mixer. Add melted butter, horseradish sauce, and salt to the potatoes. Mix potatoes until smooth and creamy. Serve with additional melted butter if desired. I can imagine just how great those sweet potatoes will work with horseradishes. The sweetness blended with spice. This is so delicious. I have been very happy with this side dish. It is nice to have sweet potatoes served in a savory way. Oh, you had me at mashed potatoes And I am a sucker for anything with horseradish! I am making potatoes like this the very next time they’re on our home menu! Where is the recipe? All I get when I click the link is your story about it and the picture. What I just went through to make this comment! Grrrrrr @ slow browsers! Anywho…I make my own version of Arby’s Horsey Sauce :). I take a heaping spoonful of store bought horseradish and add some mayo. The amount of mayo depends on how hot the horseradish is since my stomach can’t handle really hot/spicy. It also adds just enough creaminess to satisfy me, lol. I think that is a good idea to make your own horseradish sauce, you never know how hot it can be. I agree it does add creaminess that the potatoes need. I also use the CopyKat version of the Horsey Sauce. Good stuff. I love tossing sweet potatoes with a bit of grated horseradish before roasting. I bet this mashed version is great! I will have to try your suggestion! I bet the creamy horseradish sauce pairs so well with the flavor of sweet potatoes! This would be the perfect fall side with roast chicken. I need to serve this with chicken. Right now it is my steak side dish. I like my sweet potatoes less on the sweet side and the horseradish is a great addition to give it a savory flavor. It definitely adds some diversity to this fall favorite. I like the idea of roasting the sweet potatoes first. I find it gives it so much more flavor. I have done this to mashed potatoes too. 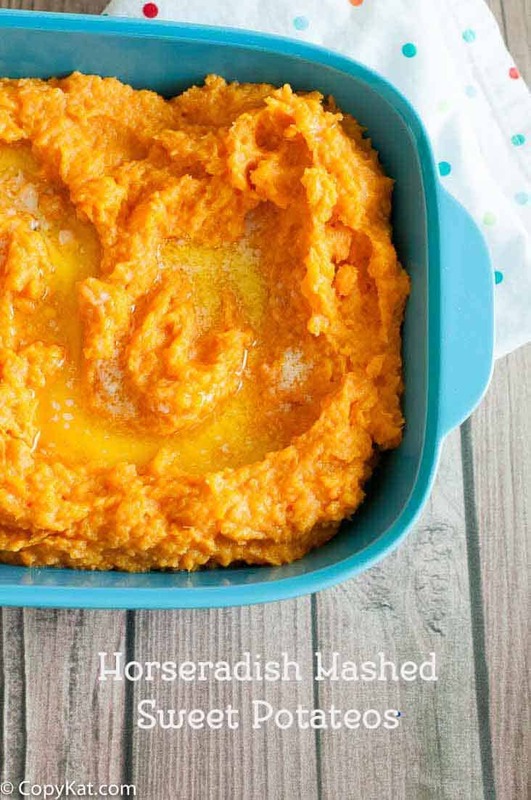 What is your favorite way to prepare horseradish mashed sweet potatoes.